Google Continues To Feed The PubSubHubbub. Google Alerts Now In Real-Time. When PubSubHubbub launched at our Real-Time Stream CrunchUp event last month, pretty much everyone in the audience immediately recognized it as a very cool thing. Basically, it takes any feed and significantly speeds up the time it takes to be found by various sources using new hubs that specifically gather that information. But the biggest fan of it may be the company that employs the two who created it, Brett Slatkin and Brad Fitzpatrick: Google. Today, Google has announced yet another service that is PubSubHubbub-compatible: Google Alerts. That’s huge not just because alerts can now appear in real-time in feed readers, but also because developers can now write applications that take advantage of getting pinged immediately when a new result for a certain query shows up in Google Search results, as Slatkin notes today on the Google Code Blog. “Think of it as an AJAX search API that tells *you* when it finds new results. Acting upon these notifications your app could update your website, email friends, send an SMS — the possibilities are endless,” Slatkin writes. Slatkin hopes that new breeds of applications are created based on the protocol. That could well happen, but for now, Google seems content to use it on an increasing number of their products. 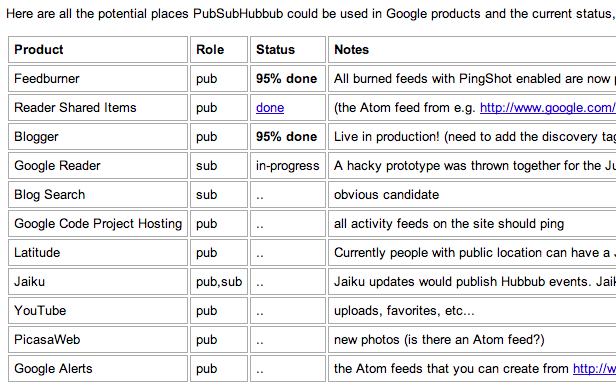 Aside from Google Alerts, PubSubHubbub is already working on FeedBurner, Google Reader Shared Items and Blogger. As Fitzpatrick noted at our event, “Nothing in the protocol hardcodes Google as the center of the world, I hate that sort of crap too.” Google may not be the center of the world for PubSubHubbub, but it is the key cog moving it forward for now. So what Google product may be next to turn on PubSubHubbub? Here’s a list of possible ones, Slatkin pointed us to, noting that many are far from certain at this point still.